I thought for a long time before purchasing a cover for my piano. I was afraid it wouldn't look good or wouldn't fit. Based on recommendations from this website, I chose the brown quilted material, and it was the right choice! The material is substantial, workmanship is excellent, it fits the piano perfectly, and blends well into the room itself. 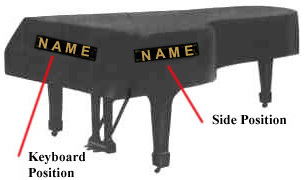 Lastly, I'm please that the piano is protected. I am very satisfied with this cover. I have only had it for a few days, but upon opening the box, I was very satisfied. It appears to be of good quality and I really like the embroidery job. I would buy a cover from this retailer again. I was pleasantly surprised that the Knabe cover arrived so quickly! The fit is perfect, and the workmanship is top notch. Thank you for a womderful product! Great seller! Cover is beautiful and fits well. I suggest you pay the extra money and go with the gold embroidery . It is beautiful and classy! Thank You!